It’s time for the foodies to unite in Seattle. If you consider yourself to be a bit of food snob, and you are proud of it, head on out to Savor Seattle Food Tours. Even if you are not the typical foodie, you can still have the experience of tasting an eclectic variety of foods while discovering the city of Seattle. Come see why the Savor Seattle Food Tours continues to be the top-rated attraction in Seattle for over 10 years. When it comes to the Savor Seattle Food Tours, you have options. The guided tasting tours are perfect if you would like the experience and expertise of a well-informed guide as you navigate through the city of Seattle, tasting delectable treats along the way. You can choose from several guided tour options which include the signature Pike Place Market tour as well as the popular Chocolate Indulgence tour. If you enjoy gourmet food, the Gourmet Seattle Tour is right up your alley, and there is even a Booze N’ Bites Tour for those that want explore some of the local Seattle bars and taverns. If you are the type that enjoys exploring on your own, Savor Seattle Food and Wine Passports is the perfect choice for you. You can choose from either a Food Passport or a Wine Passport. You simply obtain your Passport online or via the app, choose your desired tasting spots, and check-in to the applicable spots to redeem your tastings. Convenient, easy, and perfect for those that enjoy exploring Seattle independently. 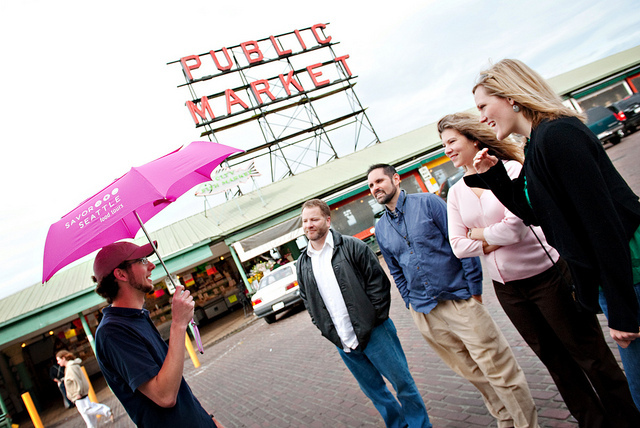 With Savor Seattle Food Tours, you get the opportunity to experience something different. While there are many visitors to Seattle that love these tours, there are also a number of locals that find this tour to be an excellent way to become familiar with their ever-evolving hometown. In addition to local tours, Savor Seattle Food Tours also offers culinary getaways. You can choose from the 9-day Heart of Italy Tour or the Gourmet Kayak Expedition in San Juan Island, Washington. If you want to learn more about Savor Seattle Food Tours, you can contact them directly at (206) 582 – 3504 or visit them online at www.savorseattletours.com. Make sure you have quality accommodations set up for your trip to Seattle. Seattle Oasis Vacations can help you find the perfect lodging for your visit to Seattle. Let us know where you would like to reside in the city, and we will find the perfect place based on your preferences. To book your vacation rental today, contact us at 206-456-5251 or browse our selection of rentals online for yourself!